Northern Tablelands MP Adam Marshall with Mayors and General Managers forming the new New England Joint Organisation in Moree on Monday. Back row, left, Narrabri Shire General Manager Stewart Todd, Uralla Shire General Manager Andrew Hopkins, Inverell Shire General Manager Paul Henry, Acting CEO of Armidale Regional Council Lindsay Woodland, Tenterfield Shire General Manager Terry Dodds. Third row, Glen Innes Severn Mayor Steve Toms and General Manager Hein Basson, Moree Plains Shire General Manager Lester Rodgers, Tenterfield Shire Mayor Peter Petty, Armidale Regional Mayor Simon Murray. Second row, Inverell Shire Mayor Paul Harmon, Moree Plains Shire Mayor Katrina Humphries, Narrabri Shire Mayor Cathy Redding. Front, Northern Tablelands MP Adam Marshall and Uralla Shire Mayor and New England JO Chairman Mick Pearce. 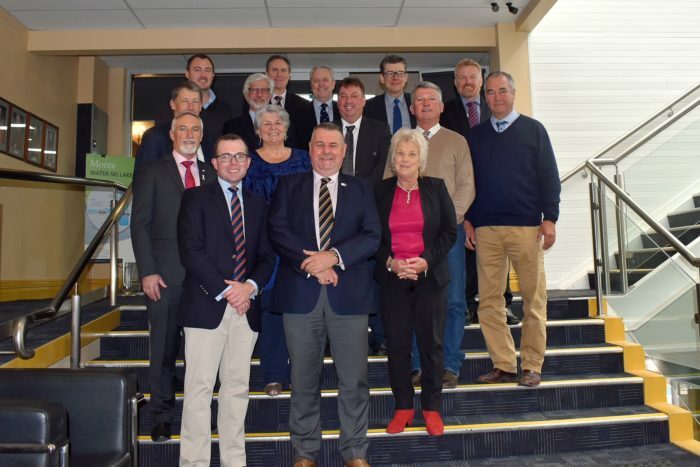 NORTHERN Tablelands MP Adam Marshall has greeted the formation of the seven-council New England Joint Organisation as a new dawn of collaboration, co-operation and competitive advantage in local government across the region. Mr Marshall attended the historic inaugural meeting of the New England JO at Moree on Monday and said it was the “start of something big and beautiful” for the member councils, promising real benefits in economic and social growth and in productivity. He said the newest joint organisation, under a State Government framework, would deliver key results for ratepayers, residents and council communities. “This is incredibly exciting and puts these councils into the box seat for securing stronger investment, strategic planning and development on a regional basis, and obviously a shared vision for our communities to prosper and grow,” Mr Marshall said. The new JO is made up of Moree Plains, Armidale Regional, Glen Innes Severn, Inverell, Uralla, Tenterfield and Narrabri councils. Uralla Shire Mayor Mick Pearce was elected the inaugural chairman and Inverell Shire General Manager Paul Henry was appointed the interim executive officer. “The group will now be able to prioritise and plan strategic development, including in infrastructure, share resources, provide strong advocacy and regional leadership,” Mr Marshall said. “Significantly it gives them an advantage in lobbying for funding opportunities, better buying power and a joint strength in the procurement of tenders and contracts to build the region. Mr Marshall the official proclamation of the new NEJO in May, set the scene for the body to now cash in on State Government seed-funding of $300,000 for JO’s to get established. “I’m a confirmed believer in the JO charter, the benefits are huge and I can say that from my experience as a former mayor of Gunnedah Shire and chair of the Namoi Joint Organisation when it was set up a few years ago under a trial model,” Mr Marshall said. Cr Pearce said one of the first big ticket items would be investigating a waste-to-energy project and the potential to involve the whole region. “The major advantage of the JO is that member councils are in a better position to lobby the government for investment opportunities as a group rather than as single, individual council voices,” Cr Pearce said. Mr Marshall said one of the first issues the JO would tackle would be to determine and adopt a Statement of Regional Strategic Priorities before the end of the year. “I’ll be working closely with the group and supporting them to pave the way for a new productive future for all the council members – they’re all on the same page when it comes to forging that new relationship based on mutual respect, joint cooperation, and regional vision,” Mr Marshall said.